The first day of the hunt, Spike asked to be dropped off where he had jumped a big-racked bruiser the year before. After crossing a wide beaver bog, he found fresh droppings, large deer tracks and rubs on a low ridge. Just before crossing a beaver dam, he saw a scrape so fresh only the top of the dirt had been dried by the sun and wind. Spike was the one who first suggested we hunt deer on Lake of the Woods, 70 miles of wilderness water that sprawls across the international border from Minnesota into the Canadian provinces of Ontario and Manitoba. Thousands of deer live out their lives on one or more of the lake’s 14,500 islands, mostly unaware of people except as passengers in passing fishing boats or snowmobilers on the winter ice. The largest subspecies of white-tailed deer in North America, Odocoileus virginianus, is found on the islands, and because very few hunt there, it only stands to reason that these bucks tend to live to an older age than the norm. The sheer number of large shed antlers we find also supports the notion that light hunting pressure allows more bucks to grow big and brawny, as do the big-bodied deer we tag, some dressing out at over 200 pounds. In three years, our parties of six to ten have only seen two other hunters. It’s like going back in time to hunt the big woods before the advent of trail cameras, food plots or even logging roads. The hunt is shaped by shorelines, bogs, beaver ponds, and low ridges dividing dense evergreen stands. As a final enticement, Ontario gun season opens a month earlier than where we live in Michigan, allowing us to climb down from the trees and set the bows aside for a week. With the rut already heating up, we still-hunt with rifle in hand. Each hunter is dropped on an island shortly after daybreak, with no one meeting up again until the motorboat returns just before dark. It requires woods sense and perhaps even survival skill, depending on how things go. So far it hasn’t been needed, but we each bring a backpack loaded with enough essentials to get through a night or two in relative comfort. The first year, six of us rented a houseboat and two 17-foot Lunds with outboards and GPS navigation. Then we towed everything 4 hours to a secluded cove, where we launched the houseboat and then secured it on the sand beach. It was our hunt camp. The small boats got us to and from the island hunting grounds. It was a great experience, but the cost was high. The next year, we trailered our own boats up and rented a cabin on the mainland. This cut the costs in half—except for Trap. 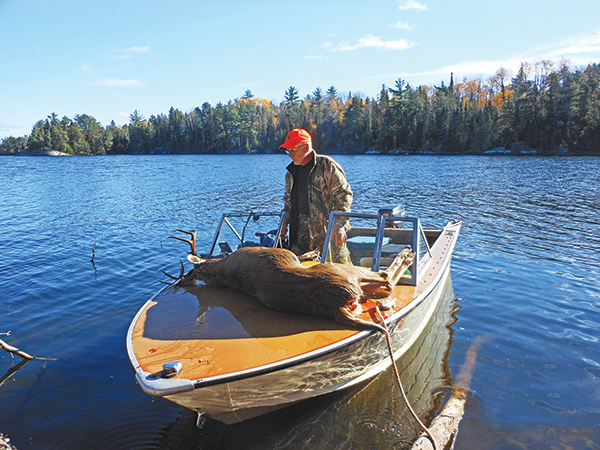 Most people buy a new boat for fishing; he bought his for hunting whitetails on Lake of the Woods. Being in good physical condition makes the hunt enjoyable. About half of our deer have been taken far enough back in that we skinned, quartered and deboned them for packing out. Working alone, a large buck requires at least two trips. But if you’ve ever dragged a deer any distance through woods, you know quartering in the field is a far easier option. When hunting a new area, we cover ground quickly until we get into fresh buck sign. Then we slow down and start truly still-hunting. Being able to return to a number of islands we know has become a big plus. Where we’ve seen bucks or sign in past seasons, it’s a good bet they’ll be there again. Downloading a topo map on a GPS unit is another very good idea, just beware that Canadian topos are scaled at 1:50,000 and not as detailed as U.S. maps scaled at 1:24,000. What might appear to be a flat on the map in reality may include a ridge broken with deep cuts. Cell coverage isn’t available. But the cabin had Wi-Fi, and each evening we studied satellite photography to help plan the next day’s hunts. By downloading data for the areas we’d be hunting onto our phones and handheld GPS units, we could benefit from the bird’s eye views even though we had no real-time link. Boat preparation is also critical, as any help is a long ways off. This time of year, only a few weeks or maybe days shy of night ice, most visitor services are closed for the season. Each boat carries a marine radio, repair tools and spare prop. Most of us have big lake experience living on the Great Lakes, and we take comfort in the fact that a couple of our guys are mechanics by trade. Having two or three boats in the group also gives us a safety edge. V-hull boats in the 16- to 18-foot range with outboards and kicker motors for backup are about ideal. Flat-bottom boats might be better for shallow beaching, but when the water out on the lake gets choppy, you can expect a wet, bouncing ride in such a boat. V-hulls part the waves and shed the splash. A boat smaller than 16-foot might be risky, and much larger might be harder to get into a shallow shore due to the draft and weight. 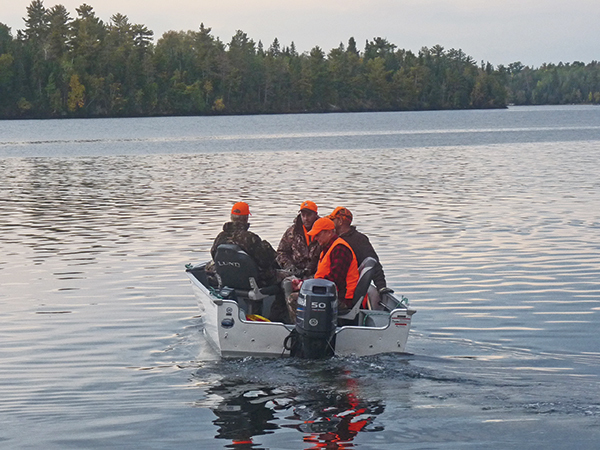 It is harder to climb into and out of a larger boat, as well as making loading gear and deer more of a chore. When we leave a boat for the day, we make sure it’s on the lee side of the island or in a protected bay, securely tied to something permanent on shore. We don’t want to come back to find a boat missing or damaged by the waves. Lake of the Woods is stained with natural tannins, and most of the reefs and rocks are hidden under this water. Having lake charts and GPS with the charts helps to avoid nasty surprises. In fact, paying close attention to the charts and staying oriented is the only way to keep off the rocks. The first year we found that out the hard way—twice. This is not a place to see herds of deer each day, but the odds of getting a shot at a truly wild trophy buck in the course of a week are better than ’most anywhere else. Following the second to last day of last year’s hunt, my brother Steve reported seeing the biggest buck he had ever laid eyes on. I knew it had to be a monster as his trophy room includes racks most men only dream about. Many of our best bucks have been taken in the middle of the day, a time when we might be napping back home. In the wilderness deer roam throughout the day, and it pays to keep on hunting as long as the light allows. Gordo was piloting a pick-up boat back to the cabin when he spotted a nice buck feeding on a knoll. After motoring a couple hundred yards down shore, he nosed the boat into the beach, and his son Bruce jumped out to put on a quick stalk. Maybe the nine-pointer didn’t enjoy the sunset boat ride back to camp, but having him onboard sure made it special for Gordo and Bruce. Locals say deer numbers are down, an increase in wolf packs often cited as the reason. We have heard and seen wolves out on the islands. My brother Shum, hunting into the wind on a rocky ridge, came across what he assumed to be a dead wolf sprawled out on the rocks in front of him. But at 20 yards, he realized the wolf was very much alive when it stood up. He froze, and the wolf, which was facing away, appeared to bed back down just below a ledge. All Shum could see was the ears. Then he noticed another set of ears a little beyond that. Scanning the area with care, he picked out two more wolves lying in the rocks. He had stumbled into a pack’s afternoon siesta. While Minnesota’s wolf hunt has been put on hold, Ontario wolf tags are readily available, and those willing to pay the high cost of a nonresident tag might just fill it. Shum didn’t have such a tag, so he eased back out and resumed the hunt for deer. We have found that the lack of hunting pressure also lends itself to up-close encounters with deer. We’ve walked by many a doe without spooking it, and bucks pause far longer than we’re used to seeing back home. But don’t count on it. Practice and become comfortable with snap shooting, as that is often the only shot you get still-hunting. These are mature whitetail bucks, after all. The islands vary from a few acres to hundreds of acres. In addition, a lot of remote mainland shoreline is reachable only by boat. Some of the locals set up baits within a short walking distance of shore and conduct deer drives on smaller islands, posting shooters where the bucks typically cross to the next island. We figure we can bait and stage drives back home. Here, we prefer to still-hunt the woods, learning where the bucks spend time and then working to cross paths with one of them. Each ridge, each drainage, each beaver dam is a new experience. Going back to the beginning of the story, Spike stood there for more than a few minutes trying to decide what to do next. He could only see the rack from the top half of the brow tines up. The cover was too open to stalk closer, and 50 yards was already plenty close enough. He decided to wait until the buck stood and then shoot. But adrenaline started getting the better of him, and he considered sneaking up to higher ground for a shot or just tossing a rock to make something happen. Instead, he raised the muzzleloader, took aim and grunted. The rack turned, but the deer didn’t stand. He lowered the heavy muzzleloader as it was hard to hold steady. He decided not to grunt again, because if the buck stood it would no doubt be looking at him, and if the muzzleloader was not raised and ready, he would get a hurried shot, at best. He took two slow steps toward a tree that would serve as a shooting rest. Never before had he experienced such a sustained flush of adrenaline. He felt like he was going to throw up. Finally, after more than an hour, the rack began moving side to side. The deer was getting up. Spike raised the muzzleloader and watched the deer stand in the scope. Then his heart sank. The buck was facing straight away, not offering a good shot. Then Spike noticed the big body was quartered slightly, put the crosshairs behind the last rib, and slowly pressed the trigger. The rifle roared, and thick white smoke obscured his view. But a breeze cleared the way, and Spike saw antlers above the junipers drop out of sight. He did not hear the deer running, which meant it was down. He reloaded as fast as shaking hands and legs would allow. When the buck stood and took a couple of faltering steps a finishing shot ended the hunt. The buck easily topped 200 pounds, and the thick, tall-tined 8-point rack grossed 148-4/8 points.